The story of a young African king who takes on the mantle of a Super Hero and the centuries’ old legacy that comes with it. Long known for its revolutionary creative vision, Marvel Comics has introduced its audiences to a diverse roster of Super Heroes since 1939, most notably with the groundbreaking Black Panther character that made its first appearance in “Fantastic Four Vol. 1” Issue 52, published in 1966, and introduced him to its massive fan base on the Big Screen in Captain America: Civil War, and now explores his story in Black Panther. Ryan Coogler (Creed, Fruitvale Station) directs from a screenplay he wrote with Joe Robert Cole (The People v. O.J. Simpson: American Crime Story), with Chadwick Boseman (Captain America: Civil War, Get on Up) returning at Black Panther. 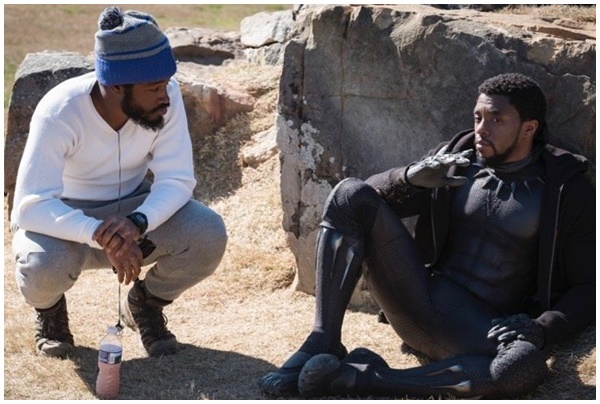 Director Ryan Coogler discusses a scene with Chadwick Boseman during the filming of Black Panther. 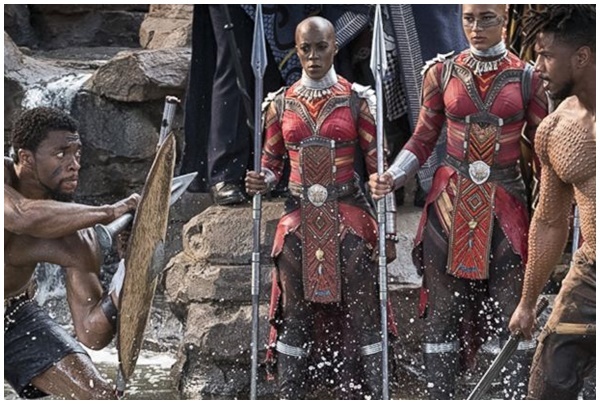 As fantastical as the world of Wakanda is, the writing team made sure that the spiritual, the mystical and the technological influences in the country’s culture were still anchored in the real world with relatable characters to allow the audiences to take in a tangible, yet remarkable experience. 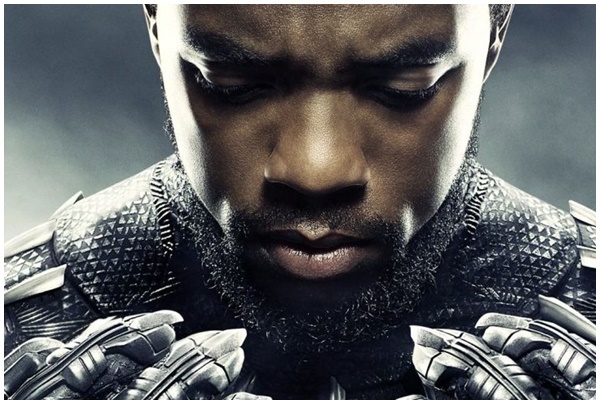 With a compelling storyline in place, the filmmakers looked towards filling the ranks of the cast to surround Chadwick Boseman’s title character. Coogler and Feige would eventually gather an enviable ensemble of pedigreed cast, culling from the ranks of film, theater and television artists from around the world. Very little is known about Michael B. Jordan’s character, Erik Killmonger, when he’s introduced into the narrative but slowly fragments of his connection to Wakanda are revealed to T’Challa. Killmonger is a mercenary who is just as lethal as Ulysses Klaue, so with the pair now united against T’Challa, the stakes have grown exponentially. Academy Award winner Lupita Nyong’o plays Nakia, a dedicated War Dog, which is a Wakandan spy imbedded in countries outside of Wakanda to observe and report back to the royal family and tribal council. Nakia is a force to be reckoned with—a highly disciplined and strong-willed woman who gives as good as she gets especially when it comes to T’Challa. Her warrior skills match those of the Dora Milaje, the elite all-female security force, which makes her an exceptionally effective operative. Best known for her immensely popular role of the katana-wielding Michonne in the hit AMC series The Walking Dead, actress Danai Gurira was a no-brainer when it came to filling the role of the fearless Okoye, T’Challa’s confidante and head of the Dora Milaje. Martin Freeman reprises the character of Agent Everett Ross in a surprising turn as an ally, albeit a reluctant one, to T’Challa. Ross again becomes embroiled with T’Challa as they cross paths pursuing Ulysses Klaue, who has resurfaced. British actor Daniel Kaluuya joins the cast as W’Kabi, Royal Counsel to T’Challa when he ascends to rule Wakanda. British actress Letitia Wright steps into the shoes of tech savvy Princess Shuri, T’Challa’s cheeky younger sister who designs all the vibranium-infused tech innovations that power Wakanda on multiple levels and enhance Black Panther’s arsenal. Winston Duke portrays M’Baku, leader of the Jabari mountain tribe of Wakanda who doesn’t see eye-to-eye with T’Challa and the royal family. Academy Award nominee Angela Bassett plays the stalwart Queen Mother Ramonda, T’Challa’s mother. The recent widow is a pivotal character that provides an anchor to both T’Challa, who is struggling with his role as leader of Wakanda and protector of its traditions, and his sister, the headstrong, brilliant young Princess Shuri. For Academy Award winner Forest Whitaker, joining the “Black Panther” cast as Zuri was akin to a family reunion with Coogler and Jordan with whom he collaborated as a producer on “Fruitvale Station.” As the Shaman of Wakanda and longtime Royal advisor to King T’Chaka, Zuri has a long and complicated history with the royal family. Andy Serkis revisits the role of the ruthless, unscrupulous South Africa arms dealer, Ulysses Klaue, who first appeared in “Avengers: Age of Ultron.” This time around Klaue is after Wakanda’s vibranium and in the Black Panther’s crosshairs. Rounding out the cast are German actress Florence Kasumba who plays Ayo, the Dora Milaje who first appeared in Captain America: Civil War; South African actor/playwright John Kani (Captain America: Civil War, Coriolanus) who returns to play T’Challa’s father King T’Chaka; and Emmy Award-winning actor Sterling K. Brown (This Is Us, Whiskey Tango Foxtrot) appearing as N’Jobu, a Wakandan War Dog. 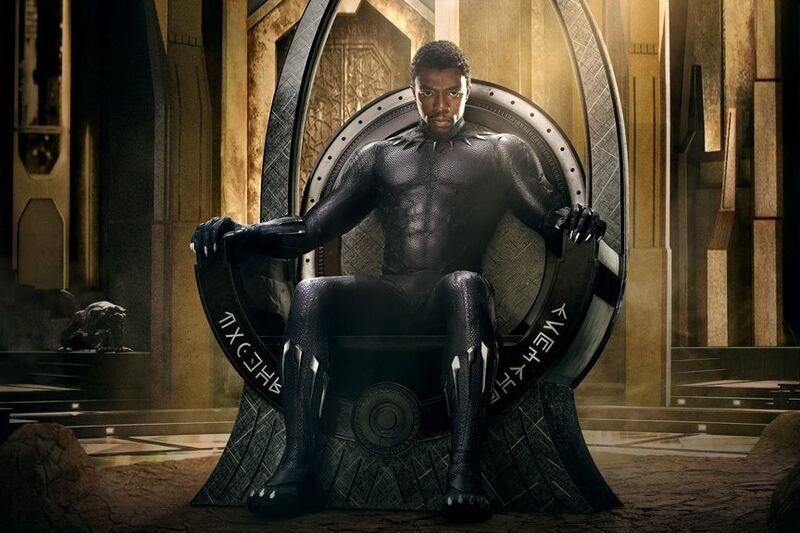 With its relatable characters and environments, along with the Marvel Cinematic Universe’s signature spectacular action, “Black Panther” is set to provide everything Marvel fans expect from a beloved Super Hero’s story brought to the big screen.